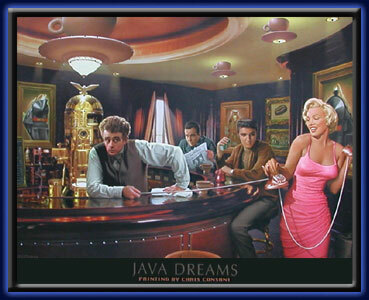 Elvis, Marilyn, Bogie & Dean gather for a drink in the bar in this artful and clever depiction by celebrity artist Chris Consani. Lighting Effects: 20 sequentially flashing yellow, red and green L.E.D. lights on the main light fixture. 12 sequentially flashing yellow L.E.D. lights around the coffee machine. 20 green L.E.D. lights around the bar. 7 Yellow L.E.D. lights in ceiling fixtures. Blue L.E.D. light flashing on the telephone.